2015 Golden Age Award honorees joined by Adriene Rosell, Gala Chairman and Mario Tapia, LCA President: Aida Rosario from Univision-41 NY; Allan Wernick from CUNY's Citizenship Now! ; Paul Meyeroff of ProCare Pharmacy; Dr. Arnold Saperstein from MetroPlus; and Dr. Mark González from Aspira-NY. (Photo courtesy of Christopher Rybin). NEW YORK, NY -- The 2015 Golden Age Awards Presentation was successfully held on June 25th, 2015 at Villa Barone Manor, Bronx, NY. 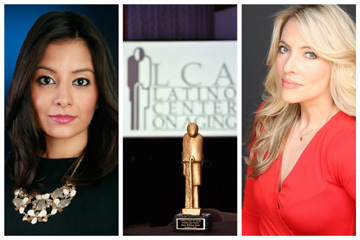 The Golden Age Awards are given to individuals who have made significant contributions to the Latino/Hispanic communities throughout the world. Awards are given for effective leadership, lifetime contributions, public policy initiatives, corporate contributions and community involvement. Photos 2010 Flash format here! 2019 Awards Gala - Payment Here! The 31st Golden Age Awards Emcees, Jessica Formoso and Giovanna Drpic. NEW YORK - April 8, 2019 - The Latino Center on Aging's Thirty-First Golden Age Awards presentation will de held on June 27th, 2019 at Villa Barone Manor at the Bronx. The Masters of Ceremony will be Jessica Formoso from FOX 5 News and Giovanna Drpic, TV personalities who, as in past years, conducted this gala with unsurpassed quality and charm. Hiram Colón and Brisa Tropical played a variety of music people loved to dance. This year's Gala Chair is Adriene Rosell, LCA Board Member; the Journal will be co-chaired by Jean Fuentes from FOX Television and Rita DiMartino from BronxCare Health System. The following outstanding individuals will receive the 2019 prestigious Golden Age Award: Dr. Ramon Tallaj from Somos Community Care; Ms. Patricia Tursi of Elizabeth Seton Children's; Luis DeLaHoz from Statewide Hispanic Chamber of Commerce of New Jersey; Cyrene Renee, Author, Poet, Playwright; and Marc Altholz from Partners Pharmacy. This eventful gathering has taken place in highly prestigious landmarks of the City of New York: The Lincoln Center (1993), The United Nations (1994, 1995 and 1996), and until the year 2001 at The World Trade Center (107th Floor). Since 2003 to 2014 was held at the Inter-Continental, The Barclay, in Manhattan, NYC. Currently is being held at Villa Barone Manor in The Bronx! Event Sponsorship [Tickets - Journal Ads] Click Here!! 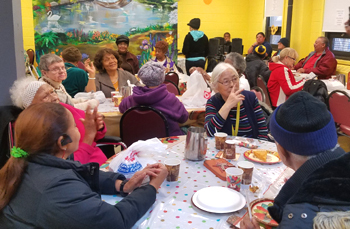 Participants at JWJ Senior Center in East Harlem enjoying company and a delicious Thanksgiving Day meal. NEW YORK - November 26, 2018 - This year's Thanksgiving Day was particularly important for the Latino Center on Aging, it marked 26 years of serving the traditional Thanksgiving Day meal to seniors without family in our communities. For the Center it is one of the most cherished ongoing projects. "The greatest satisfaction has been in turning a usually gray Thanksgiving Day into a colorful and happy day for many of the isolated elderly in New York and other eastern seaboard places," said Mario Tapia, LCA's President and CEO. "In these twenty six years we have witnessed how many other community groups and organizations are also celebrating Thanksgiving Day for the elderly and those less fortunate, which is especially gratifying" he added. Since 1992, thanks to generous corporate support and community volunteers, the Latino Center on Aging has been very successful in providing a hot meal to over forty thousand seniors on Thanksgiving Day. This year we identified seven (7) sites where the elderly participated in a Thanksgiving meal on November 22nd. These community centers are located in New York and New Jersey. The elderly participants enjoyed a delicious Thanksgiving menu and were entertained by a variety of musical and cultural entertainment. If you would like to make a donation (tax deductible) to LCA to continue its programs, please click the Donate button below now. You can donate via PayPal or use any major credit card. Please do it now! Thank you! The 2018 Thanksgiving Day Meal for the Elderly was held partially thanks to Con Edison, Platinum Care, and the support of the following generous individuals: Hon. Héctor Díaz, Carmenza Millán, Iris Fernández and Dr. Catherine Alicia Georges. For listing of Community Centers Click here!! 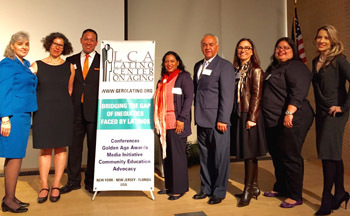 Presenters joined by some of the organizers of LCA's Fifth Conference on Alzheimer's, which took place on May 5, 2016 at the auditorium of the Silberman Aging Center at Hunter College. NEW YORK - May 10, 2016 - The Latino Center on Aging (LCA) in conjunction with CaringKind: The Heart of Alzheimer's Caregiving, Acacia Network, Inc., Union Settlement and Silberman Aging: A Hartford Center of Excellence in Diverse Aging, held its Fifth Conference on Alzheimer's, titled, “A Life Without Memory: Latinos and Alzheimer's”. This free registration conference took place on Thursday, May 5th, 2016 from 9:00 AM to 2:00 PM at Silberman Aging Center's auditorium, Third Avenue and 119th Street, East Harlem. The conference was conducted in Spanish. Being its purpose to inform, educate and train all who are involved in the care of persons with Alzheimer's disease. The conference provided a unique forum for the elderly and caregivers to discuss important issues on a one-on-one basis, offering a great opportunity to network with knowledgeable experts and those in need. 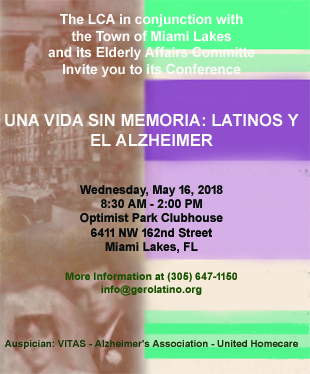 According to the Alzheimer's Association, about 200,000 Latinos in the United States have Alzheimer's, but that, by 2050, based on Census Bureau figures and a study of Alzheimer's prevalence, the number could reach 1.3 million. The general population of Alzheimer's patients will grow to 16 million by 2050, from 5 million now. “Presently there are three hundred and fifty thousand Hispanics over the age of sixty residing in New York City, a number that will double in the next 35 years. We need to make best efforts to educate our community on this debilitating disease,” said Mario E. Tapia, President and CEO of the LCA. The conference was sponsored by CaringKind, Omnicare, Royal Care NYC and MetroPlus. The graph shows the statistical projection of the population over 65 years of Hispanic origin residing in the USA. From 2.9 million in 2010 is projected to 17.5 million in the next 35 years. In New York City the present number is over to 350,000. Services and programs for this segment of the population does not go according to its rapid and unprecedented growth. NEW YORK - April 22, 2018 - The Latino Center on Aging (LCA ) is redoubling its efforts to continue bringing information to the Latino elderly and their families through a monthly radio segment in La Nueva (The New) FM 93.1 HD Radio. This initiative is of particular importance due to the increasing population of Hispanic elderly people living in the New York Metro area and their future projection. This projection represents a big challenge. According to the U.S. Census Bureau, presently there are over 350 thousand Hispanics 60 plus residing in NYC, number that will double in the next 35 years. The need for information about existing programs and services proves to be more than obvious, besides of being crucial. The LCA is bringing its years of experience and knowledge to the population of older Latinos, with respect for their culture and language. The determination of the Latino Center on Aging and its Board of Directors for the new year is to bring the whole community of elderly Hispanic relevant and timely information on topics of interest through educational conferences and media utilization. Our work continues, together we can and should improve things. For "Para Mayores" audio in Spanish, click on this photo. 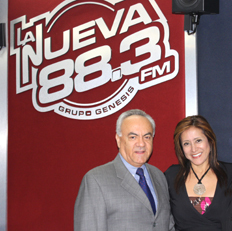 PEMBROKE PINES, FL -- April 22, 2018 -- This Wednesday, April 25 at 9:45 AM, LCA is back on the airwaves with its radio segment on La Nueva 88.3 FM Radio in SF and in the New York Metro area on 93.1 FM. Conducted by Mario Tapia, LCA's President and CEO, brings information on topics of interest to the growing Spanish speaking elderly. Tapia will be joining Liliana Marin, show conductor. Our new homepage has been underwritten by the generous support of our friends at San Vicente de Paul - Archcare Health Center and Buena Vida Center.